Reproduced below is a recent Facebook dialogue between me and friends about the 1984 Sikh massacre in Delhi, India. The dialogue is presented verbatim with correction of typos. Deepanjan – And we are a civilized and tolerant people! Pawandeep – Sometimes, it’s not the people. It is the State! Gurdas – Deeps: Well said. I gave up the notion of Indians being tolerant a very long time ago. We are amongst the world’s most racist, violent, and intolerant race. Pawan: I am not sure I understand your comment. Are you saying the State is accountable and not the people who participated in this pogrom? But isn’t the State a collection of individuals. I have no anger towards the government (as a body) or the population of Delhi (again as a body). The moment you say State, Government, etc it makes accountability very difficult. My anger is directed and pin pointed at every individual (starting from Prime Minister Rajiv Gandhi to Congress man Jagdish Tytler to the Poilceman who watched silently to every person who burnt, raped, and looted). And in that sense, I will say it is not the State, it is individuals. Try these individuals, hold them accountable, and justice will be delivered. 1. This is in a way similar to what happened in Gujarat Riots.. hard to pick up individuals except the Chief Minister and his aides directly… as the people who did it is a mob, which does not has any face..
2. Evidence against Tytler is minimal, and CBI has already given a clean chit to it.. then PM is no more.. These are also the reasons I tend to agree with Manmohan s’ take on it… Can’t keep this issue alive always in our hearts.. Move on.. and let the law take its course..And. I think the more one carries hatred and anger in one’s heart about this, the more bad for him individually and the more the possibility of him getting exploited politically..
1. Delhi is different from Gujarat, where the violence was widespread and sometimes in remote areas. With 1984, the massacre is dead center Delhi. The mob has many faces and some are seen in the few pictures available. But not every face needs to be seen. How about the police stations under whose jurisdiction the areas of violence lies? They can be held accountable to begin with. And the CM and everybody else in the line of control. When you hold them responsible, the truth will come out. The policeman will be forced to tell he had orders to not act, and so on. 2. I am a big fan of accountability. And here is why 1984 is important. If justice had been done then, Gujarat might never have happened. We cannot walk away from this injustice and forget it. Not only because of the victims of 1984, but the future victims we will create by giving the message that mobs in India are free to kill. 3. There is incriminating evidence against Tytler. At least enough to not let him go scott free. I strongly recommend reading “When a tree shook Delhi” by Mitta and Phoolka. I quote this particular book because it is written by a journalist and a lawyer, both of whom are considered experts on 1984. 4. About the issue of forgetting it – I agree with forgiving and moving on. But, who do I forgive? Nobody has asked for it yet! Remember, 1984 is like an open wound. If the Sikhs have to forget it, somebody has to heal that wound. And that healing will come from justice. If Jagdish Tytler (just to name a person) stands up and says “I am sorry. I will repent by serving the community for next 10 years” I will go hug him and forgive him. You cannot forget a wound which is still bleeding, right? 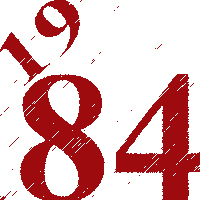 For those whose families were murdered, 1984 is ongoing…. 5. The law is not taking its course. That is the whole point. I refuse to believe that the government is unable to find evidence. In fact the government is shoving evidence under the carpet. There are pictures where faces are clearly visible, there are recorded statements about Tytler, the list is endless … again, I point you towards the book by Mitta and Phoolka (which I am currently reading). I must repeat that my anger is very directed. I have no anger towards Rahul Gandhi for example. And I am also a firm believer that public pressure can do wonders. Even get justice. It took just one shoe thrown at Chidambaram for justice to creep out and show its face. I am against violence as a course of action. My ethics teach me to stand by the weak, to fight injustice. If I stop doing THAT, THEN I will have NO peace. I am not interested in the pseudo peace that comes from shirking away from my responsibility. Gagandeep – Gurdas, I agree with you conceptually that the justice should be done.. but what makes you believe that after 25 years there is a possibility of any justice..?? Accountability in the communal violences is much more difficult to come… the sooner you realize this.. at more peace you will be… Else, frustrations of injustice will never end in the SIKHs mind.. and GOD only knows when those bottled frustrations will give rise to another ugly act of violence…. Amit – Gurdas, I totally agree with you that justice needs to be served. No doubt. But the problem, I think, is there is no unified attempt to demand justice from the govt or judiciary. No concentrated effort. It’s usually once a year news on TV channels on the anniversary of the sad event. Most victims and their families have moved on and are waiting for some kind of outcome of this case. The longer you wait for a trial, the weaker it becomes. Like Gagan said, when a mob is on riot, everyone is equally guilty. To expect that a ruling govt will try their own leaders in court is highly unexpected in India. Justice delayed is justice denied. While I am hopeful that the culprits will be brought to justice some day, it might just be too little too late. 1) There is a unified effort in the form of justice committees formed between lawyers and victims. Just that the government is dragging its feet and trying every possible trick of subterfuge. 2) Delhi had enough army stationed in and around the city to wage a war, let alone stop a MOB. I highlight mob because this was not a mob! A mob in an impromptu congregation of violent individuals. What happened in Delhi was an organized rampage in complicity with city leaders. There is a reason why people like Jagdish Tytler are being protected. I have a suspicion that if he did get charged so many skeletons will come out, that many of Congress’s top brass will be behind bars. Like you said, I do not see that happening. Amit – Gurdas, When I said unified effort, I meant by the general public – victims or concerned citizens. And they too will need a strong and influential leader to get it heard anywhere. I would rather not depend on committees formed by lawyers. But again, who has the time? And for how long? As for Army not responding to the riots, when the riots take place at the behest of the ruling govt. neither army nor police will move a muscle. Whatever happened was evil and unfortunate. I am not sure what’s the best way to put a closure on this case. The political, judicial and police system are too corrupt and colluding to get justice. If you were looking for a high- profile name to be tried and sentenced, it’s unlikely now that Tytler has been acquitted by CBI and congress rules at the center. What’s your take on getting justice? Gagandeep – Talking about the efforts, there are efforts underway like the other day when I was in NJ Gurudwara, California-based Jasbir (one of the witness against Tytler who heard his orders of SIKH Killings in Delhi) had come there to gather support both morally and financially. He gave statements to Nanavati commission in 2002 but CBI said they couldn’t trace him .. and wanted his statements taken again.. in 2004.. He swore he would go any day if called by CBI.. and claims he was not contacted.. even though he admitted there were open threats to him and his family.. He is already in his 70s… There are few witnesses left.. many have already been killed long back.. Those left will not live forever to testify again and again and again.. and Congress knows this very well and is making process delays as their weapon too..
Gurdas – Amit: To win the game, we need to play it. Or at least cheer those who are playing it. Writing on facebook, sending an occasional email, or other similar efforts are my way of keeping the memory and consciousness alive. And then we wait for the wheels of time to turn. But forgetting it is not an option. Because there are 3000 corpses lying in the middle of Delhi and their stench fills me with disgust. No, I cannot forget until those bodies are given a fitting burial. But one must write responsibly, and not quote stories and rumours. So, I am doing my due diligence of reading what little is out there about 1984 (on Sikh extremism, the subsequent attack on Golden Temple, and Sikh killings in the aftermath of Gandhi’s assassination). Gurdas – Gagan: Good input. Amit and Gagan: May I use this dialogue as an article on my blog? Amit – It’s sickening, but not surprising, to learn that the agency entrusted with the responsibility to investigate the incident is lying about the testifying witnesses. Everything is influenced by politicians. If Mr. Jasbir ‘s testimony in 2002 has been brushed under the carpet, and his whereabouts declared unknown, I bet no matter how many times he gives statement, they would all be buried. CBI investigates the case, CBI comes under PMO, PM appoints CBI chief, PM belongs to congress, the alleged convicts belong to congress, good luck with getting justice. As much as it breaks my heart, even if a Sikh PM, who knows all the facts, did not move a brick in the last 5 years in power, who do you think you can rely on for getting justice? Can you think of even one politician ever tried successfully and sentenced? People can donate money and sign statements of support, but what purpose do they solve other than highlighting the case locally, for some time. Gagandeep – Sure do Gurdas! who knows… One thread less makes the wire snap! I am an avid tea drinker. Not that I drink gallons of it, just that I cherish each sip. A well brewed cup of tea (and that rules out any tea made by a machine) can do wonders to my mood. I can get almost intoxicated. And tea has led to many a memorable conversation with family, friends, and strangers. Once in a while, it plays a larger role and a whole friendship is built around it. That is what happened between me and The Patels who live on the floor above. 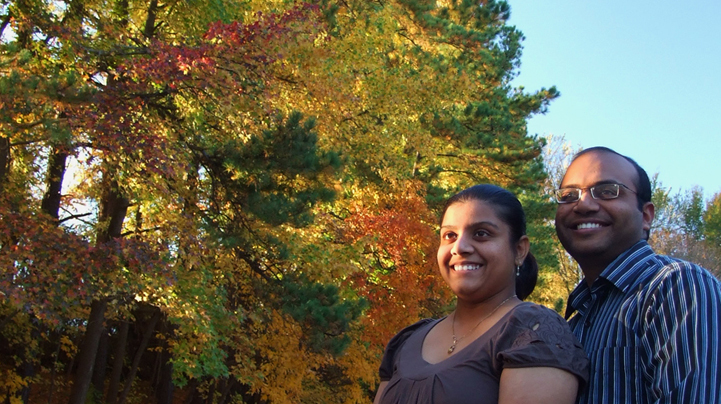 Keta and Baiju Patel had moved to Raleigh a few weeks before I did and they immediately welcomed me into their lives. Baiju is an avid tea person. And Keta is almost a no tea person and yet her tea is worth every moment spent with the cup. We would meet often for tea and talk. Recently, Keta went on an India trip for a marriage and during that six odd weeks, Baiju and I met almost every day for tea. Every day at 10 pm. It was something I would look forward to with enthusiasm. Our meeting would be short and yet packed with useful conversation. Baiju was here for a MS in Advanced Analytics and I was taking introductory courses in Statistics; so there was quite a lot of common ground for techie stuff to be discussed. Like today, Baiju educated me on “basket analysis”, something stores like Wal-mart and Family Dollar conduct to find the chain of products a particular shopper would buy. In very simple terms, which buyer will have what products (typically) in his/her shopping basket. And I led Baiju to some outdoor educational videos at REI. So, in that short 15-20 minutes, we had tea and came out better informed about something useful. And at the end of the meeting I would be refreshed and eager to get back to work. Tea plus conversation has that effect on me. But, this is now coming to an end. 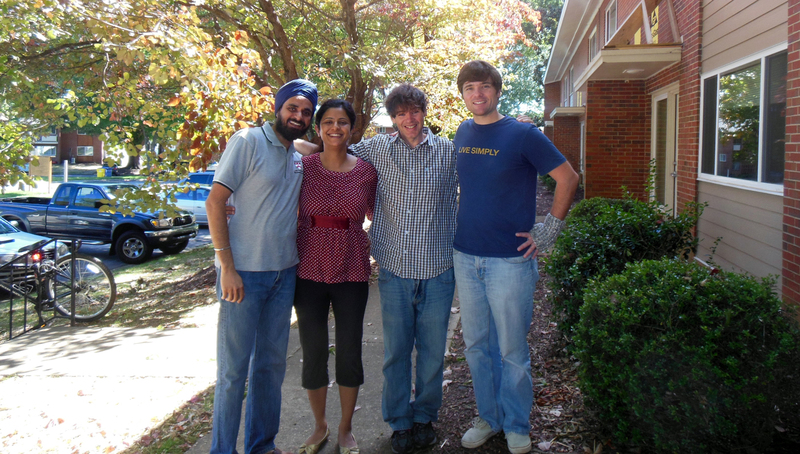 The Patels are moving to Charlotte, where Baiju landed a job. I will miss the tea meetings terribly. And by the end of this summer, I will lose almost half of my closest friend circle at NC State. This makes me kind of sad. I take this opportunity to thank The Patels for opening the doors to their house and their hearts. I am wealthier having known you’ll. Bon voyage! Surrounded by the din of the marketplace, I began my ritual of reading the newspaper. I had on me merely Rs. 10 for purchasing the two newspapers which carried news of the health camp we conducted yesterday. As I was scanning the pages, my daughter asked me for some money. She must have read the questioning look in my eyes for she promptly said that she wanted to give some money to a poor lady. The poor lady in question was a destitute who had occupied a certain corner of the market for so long that one could not imagine the market without her. My six year old daughter had a special corner of concern for this lady, for even in the past she has asked me to give that lady some money. I fished out two Rs. 2 coins from my pocket, hesitated for a moment, bemoaning the fact that I did not have a Re. 1 coin and gave one of the 2 rupee coins to my daughter. She instantly disappeared with the coin and I burrowed myself in the newspaper. I had hardly moved a paragraph that my daughter appeared, tugged at me and insisted that I come and take a look at the old lady. I knew the haggard state of the old lady so I tried to avoid the encounter. Yet my daughter persisted and I gave in. The old lady was dozing, possibly due to the effect of liquor. It was a little disappointing for Harshal that the old lady had not seen her doing the act of charity and understandably it deprived Harshal of some satisfaction. We ran a stall for handmade aromatic soaps made of natural extracts, and as we headed back to this, the following conversation took place. Harshal: Papa why was the old lady lying like that? Me: I don’t know baby, most probably she was sleeping. Harshal (giggling to herself): Is this the place to sleep? Me: But Harshal , she does not have a home. Harshal (a bit concerned this time): Does she have food to eat? Me (haltingly): Most probably no. Harshal: Papa are you not someone who helps the poor? Me (at this stage a mixture of emotions – pride, guilt, feeling small and yet concerned): Yes Harshal, but there are too many poor in the world, I cannot help all of them. Harshal (after some silence): You had ten rupees with you didn’t you? Harshal (almost seizing my words): So why did you not give it to the old lady. At least she could eat something for today. I did not reply to her after that. We kept walking silently amidst the humdrum. For a while all the noise faded in my mind as it retraced its steps back to see the prostrate figure of the old lady. Where will she spend her night? What does she look forward to for the next day? What could I have done for her? What can I do for all these poor? I am already trying, but is this enough? Anurag and I go back a long way. Some 18 odd years. We first met on the playground in his neighbourhood. He was a fierce competitor and the best leg-spin bowler I have faced. After high-school, we moved on with our lives, each pursuing an engineering degree in different universities. Until we got together again last year. He had mellowed and that somehow made his fierce desire to get things done more visible. 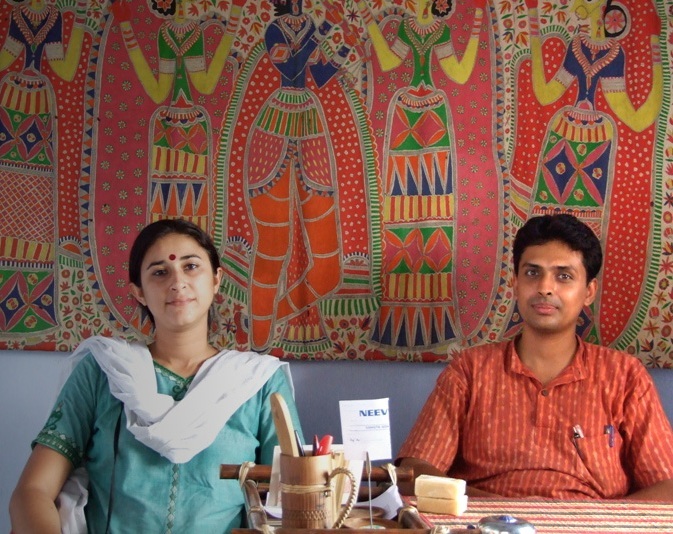 Both he and Shikha (who he met during his engineering days and later married) left their jobs to take-up the social cause of enabling the urban poor, through the vehicle of NEEV (New Education and Environment Visions).